Humans are curious animals, and some who visit Loch Ness are more curious than most. In the 1960's and 70's some investigators found their studies of water monsters overlapping with their other interests on the fringes of Science as they witnessed a variety of anomalous events even when away from the water. The contemporary books and articles which recorded them are increasingly hard to find, and so I am persuaded to reproduce some of that material here, not because it necessarily relates to the "monster" phenomena, but simply because it helps to give a broader view of the times. I will be including stories of mysterious big cats, poltergeist activity and telekinesis, but to start with I am able to reproduce a couple of articles from the 70's and 80's about UFO activity around Loch Ness. The first article was written by my old friend Ted Holiday in 1973, covering an exorcism by Dr. Omand and a flying saucer sighting (complete with aliens) by Jan-Ove Sundberg; and the second is a follow-up and commentary on it by Steuart Campbell from 1981. Both articles were published in the excellent and authoritative British quarterly "Flying Saucer Review" and are reproduced here by kind permission of its distinguished Editor, Gordon Creighton, MA, FRGS, FRAS. W HOSE idea it was to exorcise Loch Ness I am not sure. Initially I read Dr. Omand's book and noted that he rejected the Loch Ness monster as an animal. After some correspondence on the subject I went to stay a few days with him in Devon. It turned out that he had already consulted various ecclesiastical authorities such as the Bishop of Crediton, and was of the opinion that an exorcism was desirable. We arranged to rendezvous up at Loch Ness later in the year. While this was occurring John A. Keel drew my attention to the claim of a Swedish UFO-researcher who reported a landed UFO and occupants at Loch Ness. I noticed at once that this alleged landing had occurred three days after my friend Graharn Snape and other witnesses had watched a low-flying lumin-ous object travelling down the loch. Correspondence with the Swedish witness followed. Correspondence also took place with a graduate student at Millport, Isle of Cumbrae, studying for a doctorate in marine biology, who had been diving in Loch Ness and had made a curious discovery. My book The Dragon And The Disc had just been published calling attention to the unexplained paral!els between Bronze Age art-efacts and UFO reports. Dr. Omand, a retired Anglican vicar, is an exorcist with an international reputation. 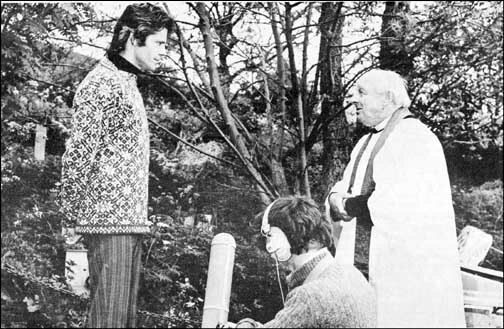 This year (1973) he has carried out exorcisms in places as far afield as Syria, Scotland and Spitzbergen. He is held in particular esteem by circus people throughout Europe over his ability to spiritually 'delouse' potentially dangerous places such as big tops, and wild animals. "The genuine exorcism - carried out in working dress with a minimum of publicity. Capt. Artus (left) with Dr. Omand. 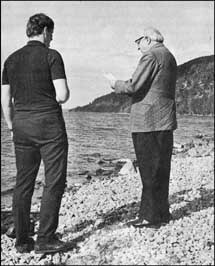 I met Dr. Omand at an agreed place at Loch Ness on June 2, 1973. Due to an unguarded comment made by me during a television interview some weeks earlier it was clear that a television team was in the area intent on filming the exorcism. However it was felt that they would be satisfied with a re-enactment and the genuine ceremony should be performed without publicity and as soon as possible. We conducted it that evening. Five of us set off in two cars. I went as a passenger with Capt. A. Artus, a serving artillery officer, to pinpoint the four sites at the four extremities of Loch Ness previously selected for the performance of the exorcism rite. We stopped first at the beach at Lochend where a protective ceremony was enacted. This consisted of a brief service followed by the application of holy water in the form of a cross to the foreheads of the participants. In view of what took place later this fact seems rather significant. "Grant that by the power entrusted to Thy unworthy servant, this highland loch, and the land adjoining it may be delivered from all evil spirits; all vain imaginations; projections and fantasms; and all deceits of the evil one. 0 Lord, subject them to Thy servant's commands that, at his bidding, they will harm neither man nor beast, but depart to the place appointed them, there to remain forever." The party then proceeded via Inverness to a point on the south-east shore, then to Fort Augustus and finally to Urquhart Castle, at each of which places the exorcism was performed. The final rite had to take place in the middle of Loch Ness and I managed to borrow a suitable boat for this purpose. "I adjure thee, thou ancient serpent, by the judge of the quick and the dead, by Him who made thee and the world, that thou cloak thyself no more in manifestations of prehistoric demons, which henceforth shall bring no sorrow to the children of men." Dr Omand being interviewed by BBC television during the re-enactment of the exorcism. had come to expect, he told us, with every successful exorcism. On Sunday we rested; Monday was given over to a re-enactment of the rite for the television people. Later in the day I was involved in a peculiar incident that could easily have drowned two of us in the loch. On Tuesday evening a rather frightening manifestation occurred. Before describing this it is necessary to deal with the alleged UFO landing. "I observed the object travelling from left to right in the night sky, approximately level with the background hill peaks. It was travelling almost horizontally, very fast, but in perfect silence. It was irregular in shape although roughly circular. The most impressive feature was the colour which was a white core with a purple/violet annulus around it. Size is difficult since so much depends on the distance between observer and object. Assuming it to be directly over the loch I would estimate the minimum core diameter at 5 feet with a maximum of 10 feet." This witness saw only one object, the date was 13 August, 1971.
occupants were claimed to have been observed by Mr Sundberg. short cut to the power station construction site. It was between 8.30 and 9.30 in the morning. Suddenly he saw an odd-looking machine about 70 metres away standing in an open space amongst some trees. It was shaped rather like a grey-black cigar about 10 metres long with a curved standing portion at one end which gave it the appearance, in profile, of a huge smoothing-iron complete with handle. Three creatures then appeared out of nearby bushes and stood together a moment or two as if communicating. These beings, including their heads, were dressed in what looked like diver's suits. They were grey in tone. At first Mr. Sundberg thought they were humans - divers from the Foyers project. They were about 1.75 - 1.80 metres [i.e. of 'normal' size, about 5 ft. 8" inches to 5 ft. 10" inches. EDITOR] high, and he watched as they walked over and climbed into their UFO. They did this by stepping through a door or panel in the upper part of the curved portion. When all were aboard the object lifted silently and vertically to a height of about 15 - 20 metres when it moved rapidly in near horizontal flight up and over the hill. When it was clear of the hill Mr. Sundberg had the impression that it started to descend again - probably in the region of Loch Mhor. Eileen Buckle's sketches based on Mr Sundberg's crude drawings. 1. (Left) Headgear of occupant. 2. (Right) The landing site. The appearance of the occupants. View of the landing area from where the witness was standing. Diagram showing shape of UFO stated to have been seen by Mr. Sundberg. Mr. Sundberg says he had a camera around his neck during the whole of this encounter with 20 unexposed frames in it. He finds it impossible to explain why he didn't shoot every frame and describes it as a sort of 'paralysis.' However. as the last entity was stepping into the hatch, he managed to lift the camera and take one picture. He says that this picture was sent to the Gothenburg UFO group who returned it as 'unidentified.' In August, 1972, he sent it to the Lorenzens who passed it to Dr. James Harder who still has it. When the exorcism was completed I was anxious to examine the site of the alleged landing and take some pictures. However, when I mentioned this plan to Dr. Omand, he counselled against it on the grounds that he had himself seen a UFO near Salisbury Plain and didn't like the look of it. Not entirely convinced I discussed the matter with Wing Commander and Mrs. Cary, to whom I showed all the Sundberg correspondence. This was at about 9.30 in the evening on June 5. What happened then needs to be described in detail. Mrs. Cary was seated with her back to the window which overlooks the front garden. I was seated facing the window. The Wing Commander was standing somewhere on my right. The evening was overcast and the room rather gloomy. Mrs. Cary twice cautioned me not to visit the UFO-site using the argument: "One reads of people being whisked away. It may be nonsense but I shouldn't go." Coming on top of Dr. Omand's similar advice I decided not to go. At that precise moment there was a tremendous rushing sound outside the window and what looked like a whirling mass of dark smoke appeared. A series of heavy thuds shook the wall and door and for an instant I thought that the corner of the house was collapsing. A rosebush outside the window seemed to be trying to tear itself out of the ground. An initial wave of terror, during which I stared fixedly at the window, was soon replaced by calm. The episode lasted about 15 seconds. Mrs. Cary was greatly alarmed; yet the Wing Commander, standing only a few feet away, neither saw nor heard a thing. "We were sitting in the sitting-room. I had my back to the window ... Ted Holiday was facing me sitting on the sofa. My husband was in the room standing on my left by the sideboard. We were discussing flying saucers or something of the sort. Ted had told me the story of one that was supposed to have landed on the far side of the glen up on top of the hills, and he was thinking of going up there to take photos, and I said 'I don't think I would if I were you. I wouldn't go near the place. One has heard stories about people being whisked into space. I don't think I would go near there' - and I repeated this. No light, white or otherwise, was visible to me from the window. The area where the light became visible to Mrs. Cary was where the holy water had been applied during the protective rite. For several minutes after this incident I was reluctant to leave the room but finally went up to a caravan outside the garden where I found Dr. Omand in deep sleep. At length he roused and gave me certain instructions as a safeguard against such manifestations. Mrs. Cary stated: "The doctor told me later that he'd had a dream thinking that Ted needed him because he was in danger; then he woke up. He told me that the next morning.' The following night distinct knockings occurred on doors for which no cause could be found. That we are deluded in our observations at Loch Ness I tentatively accept; but the nature of the delusion was well-known to the folk of antiquity. Of the apparent threatenings, tremors of dwelling, flashes of fire and dragons, I have now had some first-hand experience. Some of this input seems to be psychic and accessible only to certain individuals while some of it is a good deal 'harder' and responds, in part, to physical research. But it doesn't respond readily or 'normally' as thousands of frustrated investigators of UFOs and monsters will testify. There seems to be a distinct hardening of opinion over all this. E.A.I. Mackay calls it "the Vallee-Keel-Creighton contention based on Charles Fort's statement 'We are property.' If this is so, it is pertinent to ask 'Whose property?' The religionists and mystics have always insisted there is some sort of choice. If this also is true then the exorcism of Loch Ness may be taken as a symbolic affirmation of this choice and demonstrable to the extent of producing the paranormal reaction described. 1. Experiences Of A Present-Day Exorcist (1970), Kimber: London. 2. Mrs. Cary is markedly psychic. One of her diversions is to pick the winner in the day's horse racing. Her standard can be judged by the fact that she picked the first, second and fourth winners in this year's Derby. However she neither backs horses nor lets her predictions be used for betting. 3. The obvious suggestion that the divers accidentally made the marks themselves was dismissed by them as impossible. Attempts by them to produce similar marks nearby failed. 4. Author of The Earth-Watchers (1973), Frewin: London. 5. The Case Of The Midwife Toad (1971), Hutchinson: London. 6. Source: Sinai by Heinz Skrobucha (1966), Oxford University Press. In an article dealing with various phenomena at Loch Ness', the late F. W. (Ted) Holiday related the report by a Swede, Jan-Ove Sundberg (Fig. 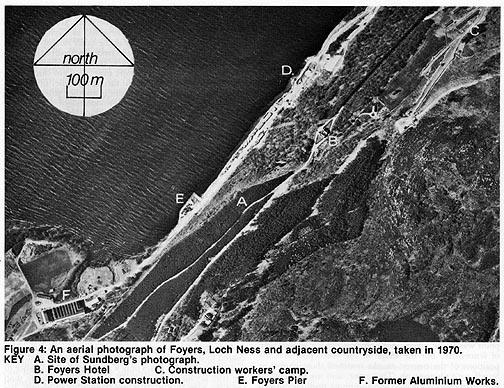 1), that he had seen a landed UFO and occupants (CE3) at Foyers in 1971. The article was accompanied by a sketch map and sketches by Eileen Buckle. The latter were based on Sundberg's original drawings. The article claimed that Sundberg had actually photographed the UFO (with one occupant stepping back into the craft), although this picture did not accompany the article. Apparently it had been sent to Dr. Harder of APRO. The incident was unknown in Scotland. Hence it was necessary to ask Ted Holiday for further information, and I was indebted to Mr. Holiday for his co-operation. It seems that Sundberg (23 at the time) had first reported the alleged incident to John Keel in the USA. Keel, who in turn had told Holiday, had no details, but thought that Sundberg was “diligent and professional”, and stated that he had provided reliable information in the past. Holiday provided me with Sundberg's address in Sweden. Sundberg confirmed that he was the witness. But, because he believed that he was being persecuted on account of his experience, he would tell me no more of the incident. He claimed that, after his return to Sweden, “mysterious men” visited him, telephone callers told him to forget all that he had seen at Loch Ness, a “black figure" walked at night in his garden leaving strange dumb-bell shaped footprints, poltergeists plagued the house, and he had experienced "bad dreams” about flying saucers. He preferred to write to me about the Loch Ness monster, sea serpents, unidentified submarines, phantom helicopters and ships, holes in the ice, and mysterious craters. He revealed that, for some time, he had been editor of UFO-Sweden's Special Report (an English language UFO news-sheet) and. consequently, that he had been interested in UFOs for many years prior to his UFO report. 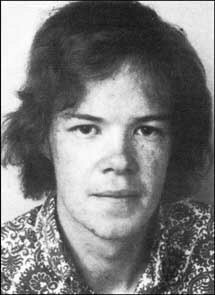 He was a member of the Motala group of Riksorganisationen UFO-Sverige, the Swedish UFO Identification Organization. He told me that I could obtain all the information I needed from Holiday, to whom he had written in 1973. Meanwhile I had already visited the Foyers area twice, and had attempted to locate the alleged landing site from the sketch map published in FRS. This proved unsuccessful. Holiday provided me with the correspondence and sketches which he had received from Sundberg. These were copied and the originals returned to Holiday. Figs. 2 and 3 show the two sketches which accompanied Sundberg's letters (“Loch Mohr" should read ---Loch Mhor"). Sundberg was in Scotland on a ten-day visit (11-21 August), assigned, so he claimed, by the Swedish magazine Lektyr to write an article about the Loch Ness monster. At Foyers he was on his way down to the site of the construction of a new hydro-electric power station on the shore of Loch Ness. He hoped to interview the men working at the station. Leaving public transport near the Foyers Hotel on the B852 (see Fig. 4), he was walking down a side road that led to Lower Foyers and the lochside. The following is Sundberg's own account of the alleged incident, as related in his two letters to Holiday. The grammar and spelling have been corrected where necessary to improve comprehension. "I had my sighting the 16th August some time between 0830-0930 in the morning, lost in the woods; on the south side of the loch. On my way to a power-station construction located near Foyers Bay I took off from the 'main road' and I thought I could walk straight onto it by going over a woody area, it was there I was kind of lost. I went through the woods because I was trying to take a 'short cut' to the power-station. But in the woods strolling around in the beautiful morning, I kind of went lost and I cannot say how. Walking around in the area I suddenly saw an extremely strange machine in an open spot in the woods, a machine that looked like a 'smoothing iron'! I was not frightened when I first saw the UFO, I was merely surprised to find a strange machine like that up in the woods, and I can still remember me asking myself.. What the hell is that? At first I thought it was some machine connected to the power-station." 'Close to the UFO were three creatures coming out from some bushes near the open spot. They looked like ordinary humans to me besides the fact that they were wearing some clothes that looked like divers suits. First I thought I saw divers from Foyers. And then I thought that it could not be, because of the strange looking machine (the UFO) near them, I had in mind to call them, asking for the road, but I kind of could not do that, there was something inside me telling me that they were not human! If you can understand what I mean. I think they were at a distance of 75-100 metres from where I was, but I could be wrong about the distance. When I realised that they were not human I just stood there and looked upon the strange scene trying to remember details. The UFO was formed like a cigar at the base, it was some 10 metres long and 4 metres high, the colour was grey-black. It had a shutter at the top, and when it opened it slid back. The creatures were some 1.75-1.80 metres high and so far as I could see they were 'normal' beside the strange clothes that looked like diver's suits. I could watch them for about 5-6 minutes. After some time the three creatures came forward from the bushes and it was then that I kind of understood that I was looking at a UFO with a crew or what it was. When the creatures came out of the bushes they stood together like they were talking to each other. I do not know if they could see me, but if they could I do not think they cared about me, because they did not leave in a hurry; as you can read from other UFO sightings with occupants involved they walked like normal men, as far as I could see. The creatures' dress was grey in colour. And what made me notice their dress, was that their heads were covered with the suit. When I stood there watching the UFO and the creatures I had a camera with 20 pictures in ... but I could not take any picture at that time. I was kind of paralysed by what I saw. I had my camera in my hand ready for pictures, but something made me not to take any photos. I think you can understand what I mean, there I was at Loch Ness, sent by a Swedish magazine to, as the editor of it said: Get a picture of the Loch Ness Monster! But instead a UFO with creatures parked in front of my camera! That was too much for me. After some 2-3 minutes the shutter at the top slid back and the creatures began to step inside one by one. I had no thought of raising my camera, I do not know why. When the first man stepped into the UFO, he lifted one leg and actually stepped inside, I said to myself that I should be quick to take a photo of the scene, but then, believe this or not, I forgot about that, it was not until there was just the last one left I raised the camera and managed to take the picture. I raised my camera and took a picture of him and the UFO. But one only picture! I can't understand that still this day, I took only one picture when I was able to take all 20 and get a real 'scoop' on the UFO sighting! When all were inside the strange-looking UFO, it took off straight up in the air like an elevator. I could not hear any sound from it at the time. And when the UFO was at 15-20 metres up in the air, it accelerated like a speedboat on the water and disappeared over the hill in south direction, apparently the UFO went down on the other side where Loch Mhor is located, because it did not go straight up in the air, it went up until it was over the hill top, and then it began to go down again! “When the UFO was gone I did not believe what I had seen, yet I was connected to UFO research groups in Sweden. I did not go over to see if there were any ground markings, because I didn't believe my own eyes when the UFO was gone. And then, like I had never been lost in the wood, I found the way to Foyers Bay and I could begin my work for the magazine. I didn't tell anybody in Scotland about what I had seen in the wood because I thought that nobody would believe me. Ten days later I went back to Sweden. It was to be expected that the fact that the witness lives in Sweden would complicate the investigation. I did not visit the witness, nor did I ask any Swedish investigator to visit him on my behalf. It seemed unlikely that Sundberg would co-operate any further, although subsequently he did assist me in locating the site of the photograph. He declined to acknowledge any requests for copies of his photograph. However, although he had sent the negative of the photograph back to Sundberg, Dr. Harder still had a print. He was kind enough to send this print to me (see Fig. 5). Harder stated that enlargement of the picture showed no more than can be seen on the original print, and that while the blurred spots at the centre might be what Sundberg claims, this was not demonstrable. When I saw the picture I knew that it had been taken pointing directly into one of the many dense spruce plantations. Clearly it was taken from just outside such a plantation where the latter was bounded by a stob-and-wire fence. In particular the position might be located by the loop of wire visible at the bottom of the picture. I recognised the fence as similar to that which bounded the west side of the road down which Sundberg had walked to Foyers Bay. This road is bounded on both sides by dense spruce forest. Consequently, another visit was made to Foyers in an attempt to locate the scene. 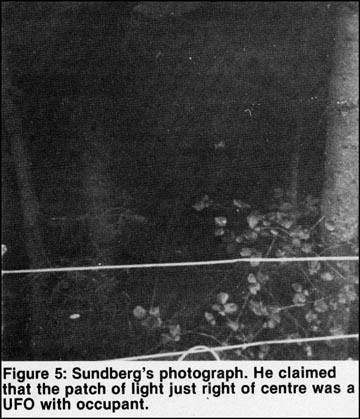 The fence was searched until a point was found where, not only was there a similar loop of fence-wire, but the shape of the fence post and the positions of the nearest trunks matched those shown in Sundberg's photograph. This point, and my photograph of it, is shown in Fig. 6. (See also photo position marked on Fig. 4.) The view was taken looking north-west into the plantation parallel to the slope of the hillside, which is downwards at an angle of about 30' to the horizontal. There can be no doubt that I found the exact location of Sundberg's photograph. Comparison shows that the two photographs are almost identical, and that Sundberg's contains no more information than does mine. The blobs at the centre of Sundberg's picture are now revealed as daylight, which shows some 50 metres away at the other side of the plantation. Due to the fact that the trees are planted in exactly parallel rows, and the fact that they have grown sufficiently to close the canopy over, daylight can only be seen when one looks straight through parallel to the lines of trees. At the other end there is another fence opening on to a more open natural woodland of birch trees. However there is no open spot within the plantation, nor any really open ground beyond it. The separation of the patch of light on both photographs is due to another fence post which falls just left of centre. This post and the situation at the far end are shown in my second picture (Fig. 7). There were no unusual marks on the ground either within the plantation or on the path the other side of the fence. Beyond this path the ground falls away steeply towards Loch Ness. Sundberg's account gives the impression that he left the road and walked through woodland. But his photograph is taken from the only road down to Lower Foyers. He could hardly have become lost on this road, especially since there are no obvious short cuts that could lead him astray. He would not have been tempted to enter the plantation, partly because of the fence, and partly because walking through a dense pine forest down a 30-degree slope is no easy matter. There are no bushes within the plantation. The only bushes visible would have been a few in the more open area the other side of the plantation over 50 metres away. One would have needed an optical instrument to see these bushes. Although divers had been working at Foyers, they had ceased to do so two months before Sundberg's visit. Sundberg's map bears only a superficial resemblance to the true layout of the area. Working only from the map (and the plan in Fig. 2) it was impossible' to identify the alleged landing site; the road pattern, the marked buildings and the scale are so completely incorrect. Regarding the UFO itself, it should not be thought that Sundberg has invented a new type of smoothing iron. 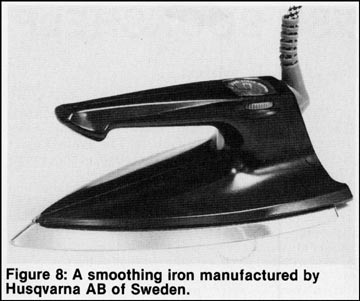 While British smoothing irons tend to have a handle that connects with the iron at both front and rear, one popular Swedish iron has a handle which is connected to the flat iron only at the rear end (see Fig. 8). Clearly Sundberg would be familiar with this shape of iron. Marquand's picture does indeed show a UFO of a similar shape. It must be recorded that there was no independent witness to the events reported by Sundberg. No reports of unusual activity reached either the local police or the newspapers in the area. When Sundberg told a well-known Swedish journalist about his visit to Loch Ness he did not mention his UFO experience. This journalist knew of Sundberg's enthusiasm for UFOs, but considered his attitude too 'imaginative'. In further correspondence with me, Sundberg has stated that he believes that UFOs are hostile, that they are preparing to 'invade us', and that they come from inside the Earth. It must be evident that Sundberg's account cannot be true. Not only does his own photograph not show the UFO and occupant, it demonstrates that the scene of the alleged landing is a dense forest with trees at about 1 metre spacing. There is no clearing as he describes. He photographed a perfectly normal Scottish pine forest. Without the photograph, I might have concluded that, although the landing site could not be found, the report could be true. But the photograph demonstrates the falsity of the story. How such a false story came about is quite another matter. It may be concluded that the report is due to either a hoax or a hallucination. Since Sundberg admits a previous hoax, it might be concluded that this report also is a hoax. However, in that case he would hardly have admitted the previous fraud to Holiday. Nor would he have reported the alleged incident in such a circuitous manner, provided a photograph that demonstrated the falsity of his claims, and assisted me in locating the scene of the photograph. The evidence does not appear to support the hypothesis that the report is a hoax. This leaves us with the theory that the report is the product of an hallucination. It would be of great importance to ufology, to say nothing of psychology, to know whether or not such an hallucination is possible. I am not qualified to comment further on this explanation, but readers will note that there are features of the account, and of Sundberg's character and behaviour, which appear to support the hypothesis. 1.“Exorcism and UFO Landing at Loch Ness," Flying Saucer Review Sept/Oct 1973 pp. 3-7113. 2. Frank E. Stranges, The Stranger at the Pentagon (IEC Inc Book Division, Van Nuys, California, 3rd ed. 1972) p. 110. Note: Every effort has been made to ensure that these two articles are accurate, complete and verbatim reproductions of the original material, as permitted by Flying Saucer Review.If there are any transcription or other errors or omissions the Webmaster will be pleased to correct them.